Montepulciano: is described in the Frommer’s guide as one of the great art cities of Tuscany (Scott is already rolling his eyes as that description), however we didn’t come here for the art but the wine area itself. Montepulciano may be a medieval town but it is the Vino Nobile that we are after tasting. The town sits at 605m and has some fantastic views of vineyards. We parked Vinnie at an Aires which is expensive to stay overnight but took the overnight option and then caught the little bus up to the town centre where we radically jumped off the bus at what we thought was the towncentre to have to walk up even further. However it gave us a chance to have a look at the Valdichiana countryside. We walked up the Porta al Prata to Piazza Grande which is at the top (sort of, there is a fortress come art gallery at the top) of the town and you have some beautiful architecture on all sides with the renaissance Palazzo and Gothic town hall. 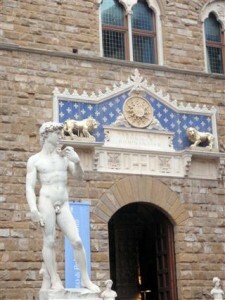 The clock tower was inspired by the Palazzo Vecchio in Florence. We wandered through the myriad of wine stores and have to say had a mediocre lunch with the wine and even the wine was a bit mediocre. It is also overpriced in the town so we picked up some nice wine at the local supermarket for a tenth of the price. I don’t mind paying a bit more for local produce but hate being ripped off. We spent a few hours continuing to amble through the cobbled alleyways of the town and slowly making our way back to Vinnie. 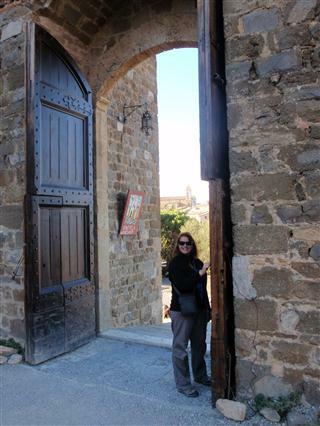 Montalcino: Montalcino was a last minute choice as we found an Aire in the GPS and read that is was a pretty medieval town and again some awesome red wines (Brunello, although made of Sangiovese grapes). We made it to the Aire and walked the 1.5kms back into the town centre where we wandered through the fort that guards the entrance (there is a wine shop in the fort – Entoca La Fortezza). The Fort (14th century) was used by the Sienese Republic after the final defeat by Florence in 1555. There isn’t a lot to see except you can walk on the ramparts. We head to the Piazza del Popola and through some of the wonderful churches in the town before braving one of the stores for a supposed free wine tasting. It is only free if you buy something otherwise it is EUR1 per tasting. We did some tasting, but didn’t really feel inspired to buy anything, until we asked some questions about Limoncello which we are struggling to buy. We really enjoyed our introduction to Limoncello in Buenos Aires, so after some information we bought a small bottle and hence our wine tasting was free. We then stopped on the way back to Vinnie to sample a glass of some difference wines and also to fortify us for the trek up. Sienna: Well Sienna was a bit of a fizzer as we couldn’t get any parking for Vinnie, so we gave up and headed to Greve in Chianti via Castellina in Chianti and Volterra. Volterra: In addition to its medieval ramparts, Volterra is famous for Alabaster. For you Twilight fans, it is also home to the principal vampire coven. The Etruscans settled Volterra in the 9th century and made their living from alabaster and alum and these are still thriving (albeit for the tourist trade) industries today. We park near the Porta all’Arco which is the only remaining ancient gate and all that is left of the Etruscan walls, however this lowly gate lulls you into a false sense of security as you turn the corner and are faced with a myriad of steep steps. The Piazza dei Priori is fairly austere with huge old mansions and a lot of crumbling architecture. The Cathedral on Piazza San Giovanni was built in the 12-13th centuries and has some lovely frescos. The plain facade of the Duomo does not even hint at the interior, it is worth going in just to look at the amazingly intricate ceilings. Greve in Chianti: We have found a free Aire in Greve so are off to taste some Chianti. 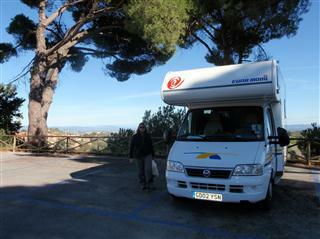 The driving in Tuscany is relatively easy so we arrive in the mid-afternoon and park Vinnie up. This is a popular aire and shortly it was full with some overflow parking in the field across the road. Greve is a short walk away and is the centre of the Chianti region. In the Piazza Matteotti it is one wine shop next to another with some local produce stores inbetween. Be warned these are targeting the tourist market. However it was a lovely little town centre and we did stop for a glass of wine to watch all the tourists go by. We stopped at the small supermarket on the way back to Vinnie to top up our wine and food supplies. We are heading to Florence as I have a flight booked to meet Natalie (www.ourbookclub.net.au) in London and Scott is holding fort here in Florence. We have found a campsite as close as possible to Florence (Michelangelo) on the Piazza Michelangelo and head there. It wasn’t too bad a drive, we missed the turn but managed to turn around and pull into the campsite. What I didn’t realise was the cost (EUR37.70 per night), so we are only staying the one night. 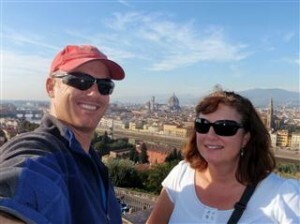 We find a relatively flat site and quickly depart Vinnie for the sights of Florence. 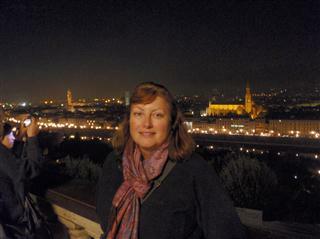 The Piazza Michelangelo gives you a view of the city where the Cathedral rises above everything else. It is also a short 10 minute walk down the hillside to the Ponte Vecchio, in fact everything is within walking distance and as the city is flat it is very easy to negotiate (well get around, navigating is a whole other story). Florence is the home of Michelangelo, the Medici, the tomb of Galileo (don’t ask Scott what Galileo did, as it leads to a very long conversation) and so much art you head just swivels. Supposedly Florence (or Firenze in Italian) was founded by Julius Caesar in 59BC as it was the link between Rome and France. To Scott’s excitement there is also Etruscan history from around 200BC here as well (sarcasm). Lots of duelling families, countries, religions etc have left Florence with some stunning architecture. It was heavily bombed in WWII (the retreating Germans blew up all the bridges with the exception of the Ponte Vecchio) and then there was the Mafia who detonated a car bomb in 1993 which destroyed part of the Uffizi Gallery. So although it has a fairly gruesome past, the city still outshines a lot of larger cities in Italy. We start with a walk along the river towards the Ponte Vecchio and head towards the Piazza della Signoria where you get to see some of the art – there are so many huge statues you don’t know where to look. So we sat in the Piazza having the world’s most expensive Late (EUR13.60 for two) and watching the tour groups head off whilst staring at the Loggia dei Lanzi where Benvenuto Cellini’s Perseus with the head of Medusa is located in addition to a copy of Michelangelo’s David, the Uffizi, an equestrian statue of Cosimo I by Giambologna, Fontana di Nettuno, Marzocco and Giuditta e Oloferne by Donatello and the Palazzo Vecchio. We don’t really have a plan just a few notes of places to go. We thought we would head to the Uffizi first, unbeknownst to us you need to book a ticket and we couldn’t get a ticket until very late in the day, then queue to actually get in at your time slot. So we decided to come back after the weekend. Cattedrale di Santa Maria del Fiore (Duomo) – this is the huge dominating feature of the skyline that you can see from everywhere. Started in 1296 it took 150 years to finish (it was consecrated in 1436) with the facade being designed in the 19th century. 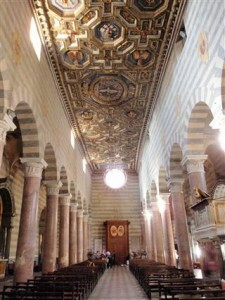 The interior of the Duomo is very simple but vast and you can climb up to the Dome. It should be noted that this was one of the first self supporting domes (designed by Filippo Brunelleschi) and was also one of the inspirations for Sir Christopher Wren in his design of St Paul’s. Battistero San Giovanni was also a surprise as it is a relatively simple building next to the Duomo, however the 13th century golden mosaics that line the inner dome inside are fantastic. It is one of the oldest buildings in Florence and Dante was dunked in the baptismal font. The outside bronze doors are meant to be the crowd puller here, but I just didn’t get it as they aren’t the originals and I preferred the interior. Basilica di Santa Maria Novella was begun in the 13th century and has a fantastic fresco of Trinity as well as some others by Lippi, Ghirlandaio (and another painting purported to have been worked on by Michelangelo) in addition to a Giotto (Crucifix c 1290). 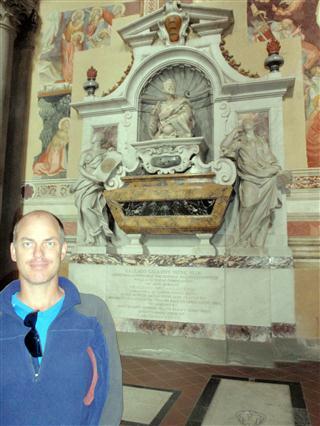 Basilica di Santa Croce and although the interior is fairly austere there are some slightly famous tombs i.e. Michelangelo, Galileo Machiavelli etc etc etc. Again Giotto had his hand in some of the murals, but they are in poor condition. Although there is some renovation work being undergone. There is also a cowl and belt belonging to St Francis of Assisi. You can access the cloisters which are serene and give you a beautiful view of the church. Considering the church was flooded in 1966 (4m of muddy water engulfed the whole Santa Croce area) you can still view some fantastic art and the famous names just keep on coming. We eventually leave Florence walking back along the Ponte Vecchio (Florence’s oldest bridge with the current incarnation dating back to 1345) which although famous is really just a long street of very expensive jewellery shops made for tourists. We head back up towards the Piazzale Michelangelo where you can view the whole of Florence as well as appreciate one of only two copies of David. This is a fantastic place to take pictures and so we had back there later in the day to get some night-time shots as well. The next day we head to Internazionale Firenze (EUR15) which is a short bus ride back to Florence and where I am transiting from.